Volkswagen offers lots of amenities inside, including a digital instrument panel and inductive charging for devices. Volkswagen finally enters the compact crossover segment in a big way by officially introducing the T-Roc. The new CUV occupies a spot below the Tiguan in the company’s lineup. The T-Roc is a stylish entry into the compact crossover ranks. The front end features a broad, hexagonal grille with headlights that integrate cleanly into the corners. LED running lights add style to the front fascia, and simulated skid plate adds some ruggedness to the design. Chrome strips add some shine to the vehicle’s profile. For extra style, buyers can order the roof in Deep Black, Pure White Uni, and Black Oak Brown Metallic for a two-tone appearance with the rest of the body. A thick rear pillar lends weight to the styling, and the heavily creased tail provides interesting visuals even when viewing the vehicle from the back. The T-Roc measures 166.7 inches long (4,234 millimeters), which makes it 9.9 inches (252 mm) shorter than a Tiguan. The model rides on a 102.5-inch (2,603-mm) wheelbase. Inside, cargo space from the top edges of the rear seats totals 15.72 cubic feet (445 liters) and expands to 45.56 cubic feet (1,290 liters) with the seats folded. The T-Roc’s cabin can be quite a high-tech place if buyers tick the right options. For example, an 11.7-inch digital instrument display is available to replace the traditional analog gauges. The standard infotainment system measures 6.5 inches, but customers can upgrade to an eight-inch display. The available Comfort pack adds amenities like inductive charging for occupants’ digital devices and a 300-watt, 8-channel stereo. The T-Roc arrives in Europe first, and VW only releases technical details for that region, so far. Buyers have several options. In terms of gasoline-fueled units, a 1.0-liter TSI has 114 horsepower (85 kilowatts) and a six-speed manual driving the front wheels. The 1.5 TSI comes with 148 hp (110 kW). It’s available with a six-speed manual gearbox driving the front axle or a seven-speed dual-clutch transmision with front- or all-wheel drive. Finally the 2.0 TSI makes 188 hp (140 kW) and exclusively comes all-wheel drive and the dual-clutch ‘box. European buyers who prefer a diesel-fueled engine have multiple choices, too. The base mill is a 1.6-liter with 114 hp (85 kW), a six-speed manual, and front drive. A 2.0-liter has 148 hp (110 kW). Customers can select whether the six-speed manual or seven-speed dual-clutch transmissions drive only the front axle or have all-wheel drive. Finally, a tune of the 2.0 TDI has 188 hp (140 kW), the seven-speed DSG, and all-wheel drive. While the T-Roc goes on sale in Europe before the end of the year, rumors don’t put the North American launch until the 2019 model year. Folks in the U.S. likely won’t have as many powertrain options, and the chances of a diesel-fueled powerplant in the range will be incredibly slim. 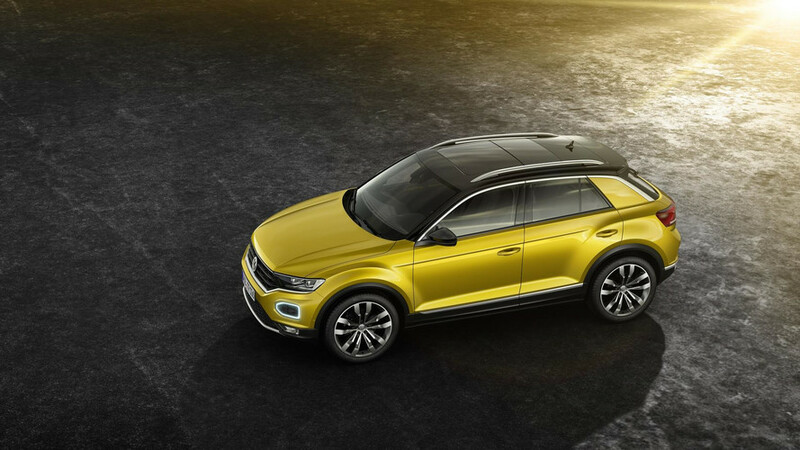 The T-Roc will have a public premiere at the Frankfurt Motor Show in September. Expect live shots of the little crossover from Motor1’s live coverage of the German event. You can watch the livestream from the event, above. T-Roc from Volkswagen: New crossover combines the dominance of an SUV with the dynamism of a compact hatchback. T-Roc surprises with its progressive design: Pioneering lines, coupé-style roof, markedly wide front end, concise proportions. SUV offensive: With the compact T-Roc, Volkswagen is completing its range of SUVs comprising the Tiguan, Atlas/Teramont and Touareg. Automatically safe: Large range of assistance systems; Front Assist with City Emergency Braking and Lane Assist as standard. Digitalised and connected: Optional glass-encased infotainment systems and new generation of the Active Info Display. Six TSI and TDI engines: Efficient turbocharged engines with outputs ranging from 85 kW / 115 PS* to 140 kW / 190 PS*. 4MOTION plus DSG: The 190 PS engines come with 4MOTION all-wheel drive and a 7-speed DSG as standard. Optimal package thanks to MQB: Compact outside, enormous inside: five-seat car has one of largest luggage compartments in its class (445 litres when loaded up to the second seat row and the tops of the seat backrests). As you like it: T-Roc Style with bi-colour design as standard) and T-Roc Sport (optional bi-colour design) enable extensive personalisation. Dominance of an SUV and agility of a compact. Volkswagen is extending its model range with a newly-developed compact-class crossover: the T- Roc. Extensive personalisation options (customer-selected decors and bi- colour design); highly advanced vehicle assistance systems (Front Assist and Lane Assist as standard, optional Traffic Jam Assist); innovative digital features (new generation of Active Info Display); ideally connected (via Volkswagen Car-Net); efficient engines (direction-injection turbocharged engines* with up to 140 kW / 190 PS*); agile and designed for comfort (ride comfort on same level as a Golf, optional DCC adaptive chassis control) and a pioneering, avant-garde design. With this configuration, the new crossover from Volkswagen brings fresh impetus to the compact SUV class. Concise exterior dimensions, a high level of interior functionality (five-seater, 445 litres of luggage capacity). A versatile vehicle – available with front-wheel or all-wheel drive (with all-wheel drive as standard including the 4MOTION Active Control driver experience switch) – which combines the dominance of an SUV with the agility of a sporty compact. A car which is as much at home in the city as it is on long journeys. Volkswagen's SUV offensive. "The T-Roc sets a new benchmark in the booming SUV segment," says Dr Herbert Diess. The Chairman of the Volkswagen Brand Board of Management continues: "With its functionality, dynamic handling and technology the T-Roc embodies all good Volkswagen qualities and will give our SUV offensive added momentum." 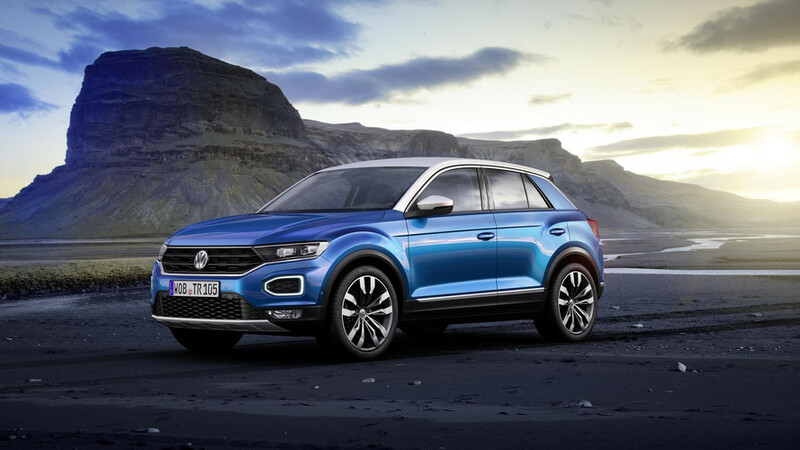 Volkswagen is launching the T-Roc in the 20,000 euro class (German market) and extending the range of its all-round vehicles to include the segment of compact SUVs. Its market launch begins in November in Europe, and pre-sales open as early as September. Four letters, one statement. The T-Roc name is easily recognisable worldwide. Dr Frank Welsch, Member of the Board of Management responsible for Development: "The 'T' refers to the car’s successful frontrunners, the Tiguan and Touareg, whose SUV DNA and strengths have been transferred to the new model – the high seating position, the robust qualities of the body and running gear and the all-wheel drive system that is included as standard for the top engines. The 'Roc' in the name has been derived from the English 'Rock', which stands for the positioning of the T-Roc as a crossover that combines the dominance of an SUV with the agility of a compact hatchback model and the dynamism of the compact class. This car really rocks the segment – sometimes louder and sometimes more subdued, according to its specific options and colour combination. A new Volkswagen which takes the brand and its owners into the next decade of mobility." Small SUVs are the next big thing. The T-Roc will launch on nearly all of the world’s key markets. For European markets, the new SUV will be produced at the Setúbal plant in Portugal (near Lisbon). A second production site will follow in Foshan, China (near Macao and Hong Kong). Jürgen Stackmann, Member of the Board of Management of the Volkswagen Passenger Cars brand responsible for Sales, Marketing and Aftersales: "The choice of these sites is no coincidence. Nearly 80 per cent of compact SUVs are currently being sold in Europe and China. Small SUVs are also gaining in importance in Brazil, India, Russia and the USA. We assume that over the next ten years the annual global sales volume of this small SUV will grow from around 6.4 million units today to around 10.6 million units." Small SUVs are so successful, because they offer wide- ranging functionality and a higher seating position with compact exterior dimensions while having a very dynamic look. Volkswagen has achieved this synthesis in the T-Roc with great success. New Volkswagen SUV DNA. 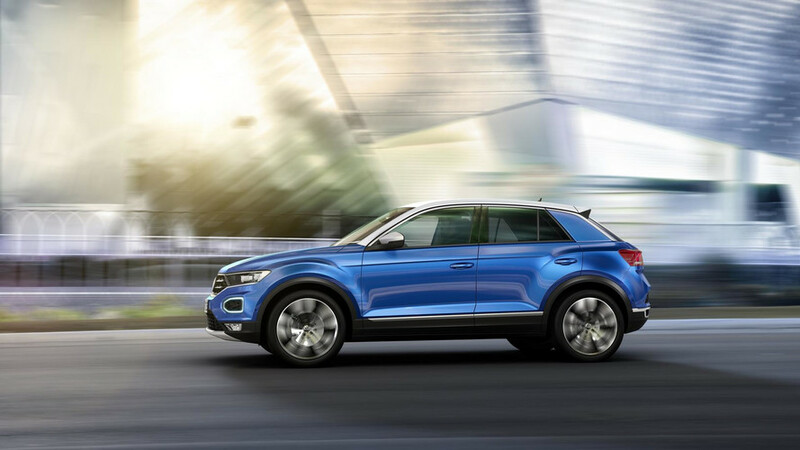 The design of the T-Roc follows a new expressive Volkswagen SUV DNA, which is similar to that of the Tiguan, the Tiguan Allspace (version with longer wheelbase) and the Atlas/Teramont. It brings authentic off-road elements into harmony with dynamism and urban style. The T-Prime Concept GTE presented in 2016 already offers a foretaste of another new SUV with this design DNA. Essentially, the design of each new Volkswagen SUV will be interpreted individually based on this DNA. All SUV models are characterised by a unique design that is unmistakably specific to their product and market segment. The T-Roc illustrates this very well. It excites with a progressive design that right away etches itself into the mind as 'the T-Roc'. At the same time, however, it clearly remains a Volkswagen. 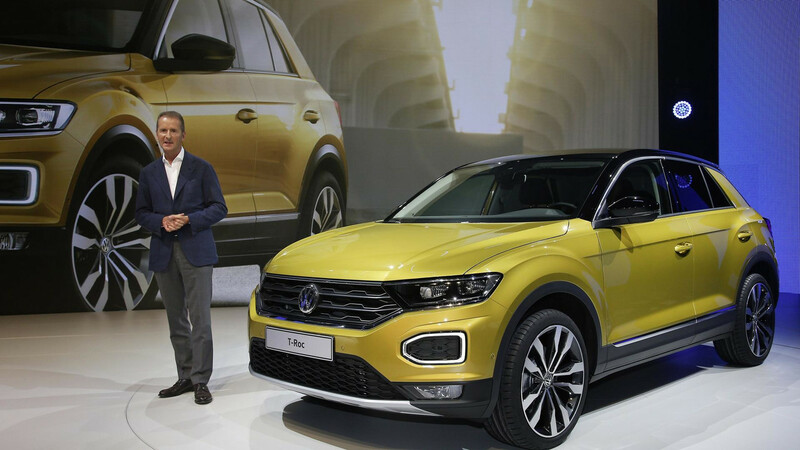 Volkswagen Head of Design, Klaus Bischoff: "Volkswagen has created another authentic SUV with the new T-Roc. This car shows its underlying dominance. At the same time, however, in launching this crossover we are also bringing a very expressive design, even "sassy" to the streets. This emotional component makes it likeable. The T-Roc is therefore equally well suited for the urban world as it is for great adventures." Sporty style. Visually and technically, the crossover also injects a powerful portion of dynamism into the compact segment. Klaus Bischoff again: "For me, the T-Roc is an SUV milestone. It enriches the segment with an entirely unique and sporty style." Dynamic proportions. The T-Roc is positioned in the segment beneath the Tiguan. Like that car, and the Atlas/Teramont, the T-Roc is based on the modular transverse matrix (MQB). This means that all three models share the same basic structural platform, but they each have a completely independent body and interior layout. Thanks to the MQB, the development team was able to implement very dynamic proportions. This is especially true of the new T-Roc. The crossover model is 4,234 mm long (252 mm shorter than the Tiguan), and it has a 2,603 mm wheelbase. The SUV's width is 1,819 mm (without exterior mirrors), and its height is 1,573 mm. The width, which is relatively large in relation to the rather low roof structure, underscores the vehicle’s dynamic proportions. At the same time, the body’s somewhat lower centre of gravity compared to other SUVs optimizes handling properties. Its styling is also defined by its short overhangs (831 mm front, 800 mm rear) and large track widths of 1,546 mm (front) and 1,541 mm (rear). Front-end design. Charismatic design elements create T-Roc styling that is both confident and expressive. In front, these elements are the wide radiator grille unit with integrated dual headlights. The top versions of the headlights use LED technology, while the headlight housings have an extremely low-profile design. This was enabled by separate housings for the turn signal, the daytime running lights and the cornering lights in the bumper. The repositioned light signature makes the T-Roc unmistakable at night as well. A narrow chrome strip separates the radiator grille and headlights from the bonnet that is large in SUV style. Moving downward, the combination of radiator grille and headlights is framed by a wider chrome accent; this lateral element spans the entire front end. The chrome accent, radiator grille and headlights together underscore the width and dominance of the T-Roc. The bumper cross panel is also distinctive; it is painted in body colour and, as mentioned, integrates the LED daytime running lights and turn signals. There are two versions of these light modules. The base version contains horizontal LED daytime running light units, and above them the turn signal units. In the top version, the daytime running lights and turn signal lights are formed by a single round LED element. The white daytime running lights switch to an orange colour for the turn signals. On the sides, fog lights with cornering lights shift downward into the black plastic surfaces of the bumper. Design of the side profile. The lines of the long, extended side profile are especially influenced by a distinctive chrome element. It is a standard feature that upgrades every version of the T-Roc, extending from the A-pillars over the entire side roof line and into the C-pillars. The latter are swept back, as on a coupé, and have the visual look of a Targa bar in a longitudinal direction. Together with the chrome trim strips, they lend the side profile a completely distinct dynamic character, whose form is reminiscent of that of a coupé. This effect is reinforced when the T-Roc is ordered in a bi-colour design. That is because the new model is the first Volkswagen SUV that can be ordered in a bi-coloured finish with a visually contrasting roof section (including A-pillars and exterior mirror housings). Essentially, the chrome strip, the additional light edges on the roof, the roofline that descends coupé-like towards the rear, the distinctive C-pillars and bi-colour paint make the T-Roc appear lower than it actually is. Connecting to the area beneath the window surfaces is the character line. This light edge is designed as a sharp undercut. To the left and right it meets the muscular wheel arches. A strong shoulder section has been created in the radius of the rear wheel arch. Rugged dark plastic wrap- around off-road trim pieces protect the body in the area of the wheel arches, the side sills and the front and rear body. Rear body design. The consistent, horizontal layout of the rear body is structured over three levels. Viewed from top to bottom, there is the roof transition including the rear window; then there is the middle surface with LED tail lights in 3D design, the VW badge and central T-Roc signature in chrome; finally, there is the bumper area. This three-level structure gives the SUV a lower, wider and more sporty look. At the top on the left and right, the boot lid is framed by the C-pillars. Towards the rear, the C-pillars are completely under the glass of the tinted rear windscreen, which creates a strong impression of width. The styling of the rear bumper is just as distinctive as that of its counterpart at the front. Upward and to the sides it frames the rear lid. On the sides of the bumper there are plastic elements (in honeycomb design) and reflectors on the painted surface. On the lower-most level are the exhaust pipe trims towards the sides (in chrome look in the ‘Style’ and ‘Sport’) and a diffuser in the middle. Package and ergonomics set standards. The form and function of the T- Roc interior has been redefined for the era of digitalisation. A conceptual highlight here is the integration of increasingly digitalised display elements and controls. For instance, the T-Roc can be ordered with a new generation of the Active Info Display (fully digital instruments) as an option. Also implemented as state-of-the-art technology are the infotainment systems, with displays up to 8.0 inches in size. With regard to the ergonomics of controls and their visibility, the goal was set to design all on-board elements to be as clear and intuitive as possible. At the same time, the charismatic and independent interior design – with its SUV image that is both confident and rugged – forges a link to the exterior design and its contemporary treatment of surfaces. In addition, the T-Roc development and design team utilised the wheelbase, which is conspicuously long in relation to the car's overall length, to create a lot of space for five occupants. The driver and passengers have a high seating position. In front, the seat height above the pavement is at least 572 mm, and at the rear seats it is 618 mm. When all five seats are occupied, cargo space measured up to the top edges of the rear seat backrests is 445 litres – one of the best figures in the segment. The rear seat backrests can be folded with a 60/40 split; this yields a cargo capacity of 1,290 litres. Hardly any other SUV in this class offers such a spacious package. New panel architecture for the digital era. The T-Roc’s instrument panel features a crystal-clear horizontal structure. The instruments form a viewing axis together with the infotainment system, which is relatively high and is therefore optimally ergonomic. The infotainment system was purposely positioned at the highest point on the dashboard, and in the version with an 8.0-inch display it has a large, glass-encased surface. This gives it a sophisticated look like that of a tablet screen. The instruments and the infotainment system are integrated in a decorative surface that runs from left to right through the dashboard. Depending on specific equipment, this accent might be dark or painted in a contrasting colour which in turn matches the trim of the seats. The colour accents are also found in the door trim, depending on specific equipment (for more detailed information on this see the chapter "Y logical structure for personalisation"). Rugged, cleanly-designed door pullers and armrests as well as large storage areas complete the door inserts for a life in motion. According to the installed features, white or red ambient lighting may also be on-board. Clean and sporty structure of the centre console. The surround of the centre console shares the same colour as the accents found on the dashboard. Integrated here over three horizontal levels are important vehicle functions (start/stop system, ESC, hazard warning lights, park assist functions) as well as the climate control functions and seat heating. Directly beneath the climate control panel is the storage box for smartphones with two easily accessible USB ports and optional inductive wireless charging and external aerial interface. Located on the centre console behind the gear knob in the all-wheel drive version is the intuitively operated multifunction switch of 4MOTION Active Control. Active Info Display and infotainment in detail. Volkswagen interface designers have systematically further developed the Active Info Display (11.7 inch display diagonal) and its high-quality graphics (133 dpi) and elevated the range of functions to a new level. The interplay between the Active Info Display and the specific infotainment system creates a new, digital and interactive cockpit. Standard equipment across all T-Roc versions includes the Composition Colour infotainment system with a 6.5- inch touchscreen. The next level up is the glass-encased 8.0-inch Composition Media system with CD player. The top system with an 8.0- inch display, Discover Media, also glass-encased, comes with a navigation module. Fully connected. The Active Info Display and the infotainment system have been systematically customised for a maximum range of online services and apps via smartphone and Volkswagen Car-Net. The phone and media library have also been integrated optimally. Both of these functions can be displayed and controlled via the Active Info Display as well as via the infotainment system. The 8.0-inch infotainment systems can be extended with App Connect (integrated MirrorLink, Apple CarPlayTM and Android AutoTM from Google). In addition, Volkswagen also offers the "Security & Service" service package in the new T-Roc which provides support in a wide variety of situations. Highlights include Emergency Service, Automatic Accident Notification and Roadside Assistance. In conjunction with Discover Media, various online services can also be used via "Guide & Inform". They include Online POI search, Online destination import, Filling station (location and price), News, Car park (location, availability and price), Weather and Online traffic information. Inductive charging, sound from Beats. With the optional ‘Comfort’ mobile phone interface, compatible smartphones can be charged inductively and be coupled to the external aerial. All this requires is placing the smartphone in a storage compartment (with mobile phone interface) in front of the gear lever. The USA-based audio specialist Beats, which was acquired by Apple in 2014, also offers a 300-watt, 8-channel sound system specifically tuned to the interior of the T-Roc. high-tech systems such as Front Assist area monitoring with City Emergency Braking and Pedestrian Monitoring, the Automatic Post- Collision Braking System and the lane keeping system Lane Assist. Another standard feature is the characteristic chrome strip in the area of the A- pillars, the roof section and the C-pillars. Other details which are always on-board include the air conditioning system, Composition Colour infotainment system, LED tail light cluster, visual underbody guard (black) and LED daytime running lights in the bumper. The base version is equipped with 16-inch wheels (‘Yorkville’). Available as an option in all versions: LED headlights and ring-shaped LED daytime running lights with a turn signal function and fog lamps (fog lamps included as standard for the ‘Sport’). T-Roc body is true to its colours. On the T-Roc Style, the entire roof, including the A-pillars and exterior mirrors, may optionally be painted in one of three contrasting colours. The additional colours of these two-tone paints are 'Deep Black', 'Pure White Uni' and 'Black Oak Brown Metallic'. The T-Roc Sport is offered in the additional colour ‘Deep Black’ as an option. In addition, ten different conventional paints are available for all versions of the SUV. Besides the colours ‘Deep Black’, ‘Pure White Uni’ and ‘Black Oak Brown Metallic’, there are also the colours 'White Silver Metallic', 'Curcuma Yellow Metallic', 'Energetic Orange Metallic', 'Indium Grey Metallic', 'Urano Grey Uni', 'Atlantic Blue Metallic' and 'Ravenna Blue'. Different interior colours. The interior is colourful as well. The base version of the T-Roc is finished with a dashpad in the decorative colour 'Deep Black matt'. The T-Roc Sport is available in 'Caribou Grey'. Volkswagen offers a choice of four different colours for the T-Roc Style: 'Black Oak Brown', 'Ravenna Blue', 'Energetic Orange Metallic' and 'Curcuma Yellow Metallic'. In the T-Roc Style and T-Roc Sport, the door accents and trim around the centre console are also finished in the selected dashpad colour as standard. distributed between the front and rear wheels via an electronically controlled multi-plate clutch according to various factors, including the engine’s torque output. This distribution is need-based – the focus here is on always maintaining optimal traction, and thereby safety, while attaining the best possible fuel economy. Under low engine drive torque conditions, or when coasting, forward propulsion comes primarily from the front axle, while the rear axle is partially decoupled. This basic drive configuration saves fuel. If necessary, the rear axle can be variably engaged within fractions of a second. 4MOTION Active Control and driving profile selection. All all-wheel drive versions of the T-Roc also have 4MOTION Active Control with driving profile selection as standard. The system is operated via 4MOTION Active Control on the centre console. The driver uses it to activate four higher- level modes and various pop-up menus. When the rotary switch is turned to the left, one of the two on-road profiles can be activated: ‘Street’ and ‘Snow’. When the switch is turned to the right, the two off-road modes are available: ‘Offroad’ (automatic setting of off-road parameters) or ‘Offroad Individual’ (variable settings). 4MOTION Active Control adapts all relevant assistance systems to the driving situation in seconds. Driving profile selection is also included as standard in the 4MOTION models. It allows the driver to individually control - depending on the installed standard and optional equipment - parameters for DSG, automatic air conditioning, electromechanical power steering, adaptive chassis control (DCC) and adaptive cruise control (ACC). The five profiles Comfort, Normal, Sport, Eco and Individual are also available. For models with front-wheel drive, driving profile selection can also be ordered as an option. Adaptive chassis control and progressive steering. The T-Roc can be further adapted to the driver’s personal preferences via a range of convenience systems that is exceptionally large for this vehicle class. They include features such as adaptive chassis control (DCC). The system's electrically adjustable dampers make it possible to make the T-Roc running gear tuning very sporty, or more pliant, as an alternative to the normal tuning. The car’s dynamic character and comfort are also optimised by progressive steering, which was originally introduced in the Golf GTI (enables better control in a sporty mode of driving and offers added ease of steering during manoeuvring). Other convenience systems include electric actuation of the boot lid, the keyless locking and starting system Keyless Access, auxiliary heating and ventilation, a two-zone Climatronic system and steering wheel heating. The optional panoramic sunroof brings ample light into the T-Roc interior. It is 870 mm wide and 1,364 mm long, which makes this tilting/sliding sunroof – which consists of two glass parts – the largest in the market segment. Personalisation is standard. It is very easy to adapt the convenience, assistance and infotainment systems in the T-Roc to the individual driver. This is done via the personalisation function that is included as standard. From the multifunction display, the driver can save individual settings for more than 100 parameters, according to the features that are installed. They are activated as soon as the driver opens the T-Roc with his or her personal key.